Simply put, Thaipusam is a Hindu festival celebrating the victory of Lord Murugan over evil forces and a demon army. This year, Thaipusam falls on 31 January and coincides with a lunar eclipse, which means that special prayers will be held to commemorate the event. There will be two chariots in the procession this year carrying statues of Lord Murugan and Lord Ganesha and they will begin their journey at the Sri Maha Mariamman Temple on Jalan Tun HS Lee on 29 January at 10pm. The procession will end at the Sri Subramaniar Temple at Batu Caves on 30 January at approximately 2pm. After the festival, the chariots will leave on 1 February at 4pm and arrive back at the temple around midnight. Along the way, devotes carry various types of kavadi (special offering) to show their thanks and pay their respect to Lord Murugan. The simplest of these are pots of milk or offerings of flowers, with the more elaborate arrangements going up to two metres! Be ready for the hooks through backs, as well as skewers through tongues, cheeks and lips – this is what makes this festival so incredibly unique. Resembling a vibrant, chaotic market, there will be stalls selling snacks and Hindu prayer items along the way. There will also be vegetarian food stalls (think thosai and masala tea), and if you can brave the crowds, a visit to the Café Villa to find out more about the origins of Thaipusam in KL is a good idea. Remember that there will be over a million visitors here on the day so be ready for that! Follow the kavadi bearers as they climb the 272 steep steps to Lord Murugan’s shrine in the cave; don’t miss (it’s impossible to) the gold painted statue of the deity at the entrance. 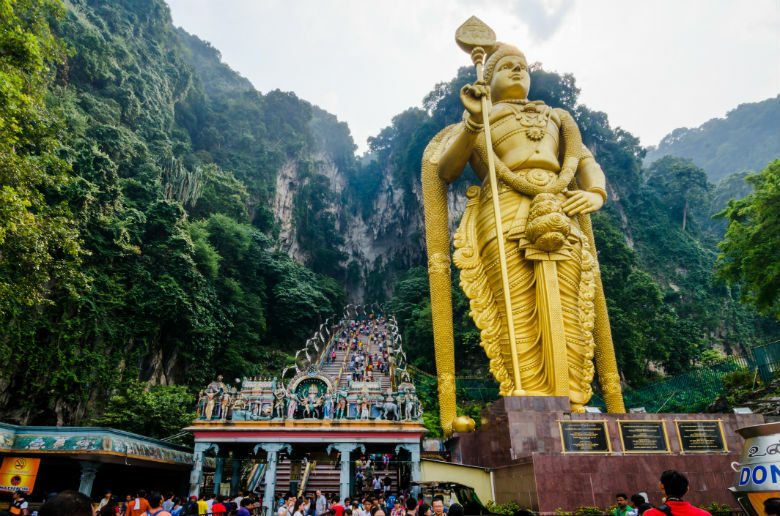 It’s the tallest of a Hindu god in Malaysia and the second tallest in the world. Comfortable and cheap shoes that you do not mind losing. You will be required to remove your shoes at the foot of the temple, and there’s a good chance you may not find them amongst the thousands of other pairs later. Bring an extra pair just in case. Loose and modest cotton clothing – no shorts. Avoid bringing bulky bags. There will be so many people and you will want to minimise the risk of losing anything. Carry a backpack or crossbody bag with water, a small towel, tissue and hand sanitiser. Bring a hand fan if the heat bothers you. It is highly recommended to travel via the KTM Komuter accessible from KL Sentral (stop at the Batu Caves station) or by bus, which will operate for 24 hours on 31 January. Parking will be impossible unless you go the night before. Alternatively, use a ride-hailing service.